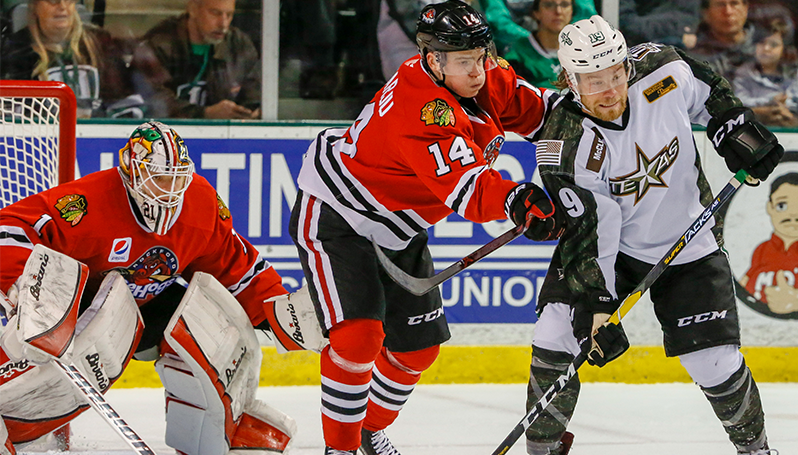 CEDAR PARK, Texas – Ty Dellandrea scored on a penalty shot at 12:51 in the third period to lead the Texas Stars past the Rockford IceHogs 2-1 in a critical divisional matchup Friday night at the H-E-B Center. Dellandrea streaked up the left side on a breakaway when Rockford took a penalty that ultimately set up the game’s decisive tally. Dellandrea, on the penalty shot, skated to the left circle and blasted a shot top-shelf to Collin Delia’s glove side to give the Stars a 2-1 lead. Jake Oettinger stonewalled the IceHogs from there, finishing with 23 saves on 24 shots in net for Texas. The rookie netminder earned his second win in as many starts and has now combined to turn away 46 of 48 shots to begin his AHL career. Peter Holland provided Rockford’s lone goal in the defeat when he redirected a shot from the point from Dylan Sikura 7:35 into the final stanza. Sikura extended his personal point streak to a team high-tying six straight games with his helper, while Matthew Highmore picked up his first point since returning from injury with the secondary assist on the play. Delia stopped 26 of 28 pucks in the defeat. He currently leads all qualified netminders with a .924 save percentage on the season. Rockford now sits five points in back of fourth place in the Central Division with just four games remaining in the regular season.